Most people we observed agreed and many signed the petition, so the Star decided to ask the Texas Nationalist Movement—the group circulating the petition—the following 10 questions. Von Ormy was a hot bed of revolution in 1836, but tell us what you think of the contemporary movement by email us at vonormystar@gmail.com. 1. 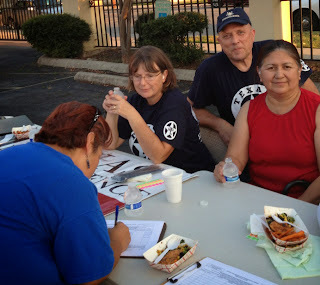 Why was the Texas NationalistMovement in Von Ormy collecting signatures? Members of the Texas Nationalist Movement are in Von Ormy seeking signatures from Texas registered voters, to place a referendum on the 2014 general primary ballot for the Republican Party that states: “the State of Texas should reassert its status as an independent nation. FOR OR AGAINST”. 2. What is Texas Nationalism? -Texas is a nation with a distinct cultural, economy, and government. -Texas should always be politically, culturally, and economically independent. -The basic political building block of Texas is the individual. -The basic economic building block of Texas is the entrepreneur. -The basic cultural building block of Texas is the family. -Texians are defenders of natural rights. -Texas adheres to the values of fortitude, loyalty, righteousness, prudence, and broadmindedness. -Texas Nationalism is the primary secular cause of all Texians and is distinct and superior to all other secular causes. -The interests of Texas supersede the interests of all other nations and states. -All political power is inherent in the Texian people, and all free governments are founded on their authority, and instituted for their benefit. The Texian people have at all times the inalienable right to alter, reform or abolish their government in such manner as they may think expedient. Texas’ unique history serves as the foundation for our current and future greatness. -There is no challenge that cannot be overcome by the individual initiative and collective will of Texians. -Texas will again be free and independent. 3. What is the Texas Nationalist Movement? The Texas Nationalist Movement is composed of liberty minded individuals that believe in peacefully restoring and protecting a constitutional Republic in Texas. Texas Nationalism is a mindset of freedom. As our Founding Fathers gave their resources, wealth and lives to establish free Republics; Texians have the opportunity to live these principles of freedom. We believe in the complete, total and unencumbered political, cultural and economic independence of Texas. We promote, secure and protect the political, cultural and economic independence of Texas. We work to restore and protect a constitutional Republic in Texas. We defend the inherent and inalienable rights of the people of Texas. We promote the values of Texas Nationalism. 4. How do you plan on achieving Texas Independence and does the plan include armed conflict? The plan involves three steps. Inform and Educate: Reach all Texans with the message of Texas Nationalism. Organize: Texas Nationalists must develop a high level of discipline and organization to share the message of Texas Independence. Action: Texas Nationalists individually and as organized groups spreading the message of Texas Independence. Texas Nationalists are committed to a peaceful legislative process to obtain Texas Independence; believing such a path will be the most successful. 5. Would Texas Independence be legal? From the Texas Nationalist Movement Website Frequently Asked Questions. 6. How would Texans benefit from Independence? Independence would free Texas from the unconstitutional mandates of Washington D.C.
Texas by having a limited constitutional republic as the Founding Fathers brought forth would have the opportunity as a nation to have a small Jeffersonian government. Texas would practice free enterprise, establish tax rates that would attract business; which in turn translate to more available jobs, and greater prosperity for citizens of the nation. 7. Can Texas survive as an Independent Nation? Yes. Texas is similar in population and Gross Domestic Product (GDP) to Australia. 8. Some Texas politicians have publicly flirted with the idea of Independence, but never actually endorse it. Why do you think Texans would embrace the idea of Independence as anything more than just a romantic idea? Such politicians are comfortable with the status quo. As Texans see the continued implementation of socialist/communist policies by the federal government; they recognize Texas as a nation where freedom and liberty can have true expression. 9. Isn't it "anti-American" to support Texas Independence? Texas Nationalists are not anti-American, we are Pro-Texas. Secessionist movements continue to gain momentum as people seek sovereignty and self-determination. Similar to the United States relationship with Canada to the north; Texas relationship with the United States is a friendly southern ally. 10. Von Ormy is 90% Hispanic; would an independent Texas embrace its Hispanic heritage? Yes. In Von Ormy there is great support for Texas Independence. All those that love Liberty and Freedom are welcome to investigate the Texas Nationalist Movement. The Von Ormy Star does not endorse the TNM, but presents their answers here without editing.